Hello guys, I have an interesting news to share with you today. After a long wait of almost 10 years, Effective Java 3rd edition is finally coming this year, hopefully, December 2017. The Effective Java 2nd Edition was released in May 2008 and updated for Java SE 6, but it been, good 10 years now and there is a lot of interest from Java developers around the world for Effective Java 3rd edition after Java SE 8 release and I am very happy to inform you guys that, finally, all our wishes are granted and Effective Java 3rd edition is set to arrive this year. It will not only cover Java 9 release but also all the changes from Java 7 and Java 8. Well, If you are a Java developer then I don't think I need to answer this question because Effective Java 2nd edition is one of the best if not the best book written for Java Developers. Its first edition has received praises from James Gosling, the creator of Java language, who himself said that even he needs this book and encourage many Java developers to buy this book. I have read Effective Java multiple times since I discovered this book on 2011. Yes, I was very late to discover this great book but after that, there was no looking back. I have learned a lot from this book with respect to designing API, using Java libraries in a correct way and in general, professional programming and I strongly recommend this book to all Java developers who have 2 to 3 years of experience. Personally, Effective Java and Clean Code shaped the way I do programming, before that, I write code, which works but after reading that I write code, which can be read and maintained better than before. It one of those books, which is not only full of practical information and best practices, which one can only learn after years of experience but also highly readable. It's one of those rare books, where you want to read every single page. What makes Effective Java great? Personally, I think, Joshua Bloch's internal experience with Java API e.g. collection framework and Java lang package along with his great insight on how to do things right using Java makes the book great. Now, coming to the 3rd edition of Effective Java. In my last post, Is Josh Bloch's Effective Java still relevant the era of Java 8, I discussed that even though 2nd edition advises still hold, there are better ways to do those things using new features introduced in Java 8 and book needs to be updated to take account of those features? In general, programming and architecture have also changed a lot in last 10 years and given that many Java developer has high regard for Effective Java book, it makes sense to update it with time to keep it more relevant. 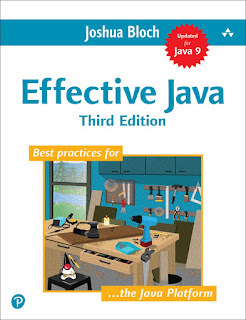 To be honest, I am quite excited about Effective Java 3rd edition and already pre-ordered this book on Amazon because I am 100% sure, it would be very difficult to get in the first month because of huge anticipation and demand. If you want to avoid disappointment, I suggest you to pre-order too. It's one of the major events for Java developers after Java 9 and Spring 5 release this year. If it's come by Christmas then it will be the best gift for all the Java developers from the world by Joshua Bloch. If you don't want to feel missed, just go and pre-order this book on Amazon here. Who is the publisher of this book? Where can I download the free PDF or sample chapter for Effective Java 3 please? Does it cover any performance related stuff as well? e.g. G1 Garbage Collector and other things introduced in JDK 8 or 9 which can improve performance of Java application? I'd like to see something on dependency injection and how it should relate to say the factory pattern since we now have @Inject. is it necessary that i first read 2nd Edition then 3rd one...? Update: Effective Java Published today, let us know if you have got your copy from pre-order, mine is yet to arrive. Hey javin, how do I get this book in Singapore? Amazon showing "This title has not yet been released."? Where can I order? Hello Tauseef, you can start with Effective Java 3rd edition, no point reading 2nd edition if we already have updated 3rd edition. Where can I download Effective Java 3rd Edition PDF for FREE? hey, you can download the free pdf of Effective Java third edition on this github link https://github.com/Hearen/Java-Books/blob/master/Effective%20Java%20(3rd%20Edition).pdf , I don't know who uploaded this but you can download before it goes away.